Benefit 'They're Real!' Push Up Liner*-Now there's been a few reviews of this one floating around. The general consensus seems to be split either way, beauty bloggers either love it or don't. I'll admit it took me a little while to get to grips with it, which I did find a bit frustrating. However, I left it aside for a while and went back to it and now I can't get enough of this. What you have here is a gel liner in a pen. The pen itself has a rubberised, angled tip so you can get in super close to the lash line. It's not flimsy and it makes lining your eyes a lot less shaky. It does take some getting used to, especially if you're not on board the winged liner train but even I can get a liner look that is presentable. As this is a twist up product I find less is more. If you get too much product out it can be a bit more difficult to apply so you may need to get rid of the excess product. Other than that I love this! It makes winged liner so much easier to do, especially if you usually find it a chore. 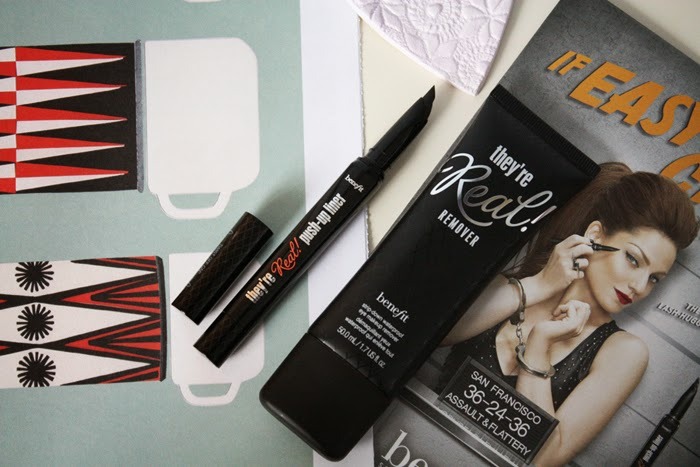 Benefit 'They're Real!' Remover*-If you've ever used Benefit's They're Real mascara you will know that it is quite a pain to remove. I'll be honest, when I first saw this product I was a bit skeptical. It really works well though! This creamy-gel based formula works almost like an oil on the eyes. It completely breaks away your eye makeup, even that stubborn mascara. I also like to apply a bit of this to a cotton bud if things get a bit messy with the Benefit liner as well. I think this is a great product, especially if you wear heavy eye makeup on a regular basis. *Have you tried these new releases from Benefit? It's good you got to grips with it - I only tried it that one time so maybe I just need another play with the liner. I really like the remover though! Yeah. It does take a bit of getting used to as I said. Maybe it's one of those things that gets better with age. Who knows. The remover is so good! I love it. I'm horrible with eyeliner, my hands are not the steadiest. I've heard good things about it and am thinking of trying it. Oh I'm currently waiting for a Benefit order to arrive, and this is what I'm most excited about. A lot of the reviews I've read have included pictures of quite a thick line, so I'm glad you mentioned that you can get quite close to the lash.